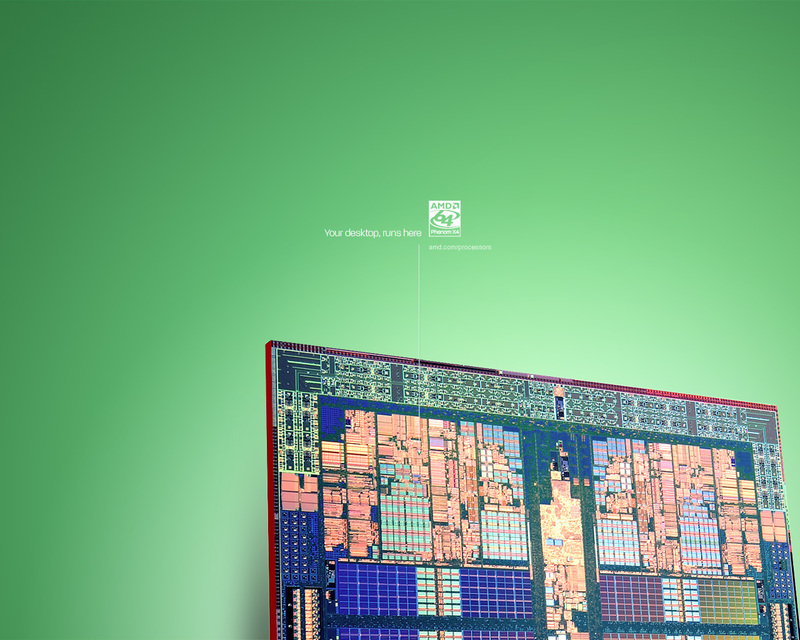 AMD today published a handful of desktop wallpapers today showing off their new Phenom brand of processors, more precisely the architecture of the four-core Agena processor. Three of them can be found on the Neowin Forums at the gorgeous resolution of 2100×2100. Not sure who has a 30″ 1:1 ratio cube monitor, but what the heck. I’m not too sure if they came straight out of a photo-shoot, but they’re a little bland. 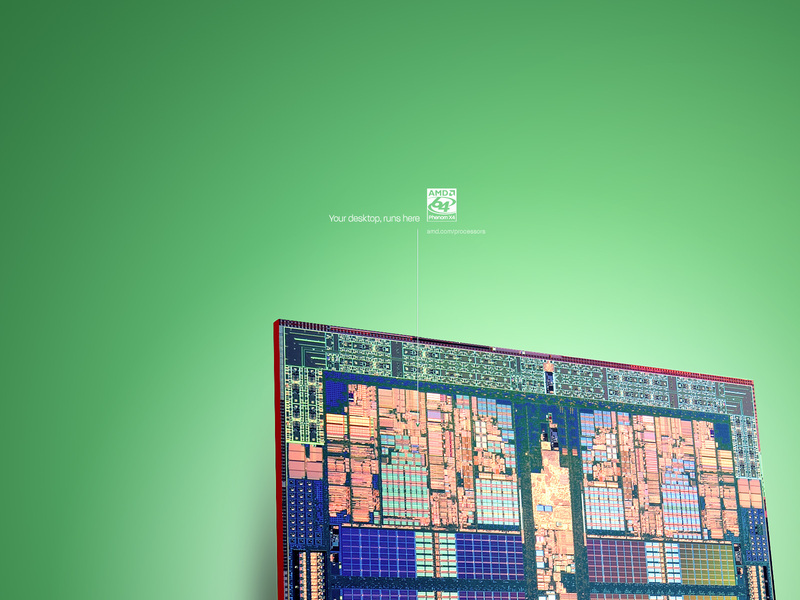 The (pee-yellow) colors are washed out, the gradients have visible banding and there’s no branding – surprised AMD’s branding team didn’t go nuclear over this. So I took some time making a little modification to it, redoing the radial gradient (with AMD’s official colors), touching up the lighting and shadows, cleaning up the colors and added a fun message plus fake brand logo. It’s pretty easy on the eyes and there’s plenty of room around the sides for icons and dancing women (if you got those). Wish you had a 1920×1200. Source files? Wow, nice touch-up job there Long. 🙂 Looks pretty neat as a desktop background too. I used Google Image Search and found about 20 more images (both AMD and Intel) suitable for wallpaper. Long you are always an inspiration! But I have a gripe. All of this reminded me of wanting to upgrade my computer. I’m on a limited (fixed) income, but I do manage to save up for things. Two months ago I got a new Sceptre X9 LCD monitor. (I will never look at a CRT again!) An last week I bought a cheapo LCD for $99 at WalMart to use as a second monitor. It doesn’t compare to the Sceptre, but works great for reading documentation while programming. But I still have $300 in my savings burining my pocket. I’ve never bought a complete computer, except for a TRS-80 and an Apple II long, long ago. My current computer has components of varing ages. The case is an Antec I bought in 2000. Still has the original 350W power supply too. It’ had three motherboards in it. The first was a Tyan that supported dual Pentium III processors @ 1 GHz. I had 1.5 GB of SDRAM. I had two Western Digital 120 GB hard drives in it. I paid premium prices for those components back then. I used that for over 5 years. Then for a short time, I had an ASUS motherboard (surplus) with the Pentium 4 2 GHz processor from my Dad’s HP computer that died. I used the same RAM ad hard drives. But the processor sucked. It was an early Pentium 4 and had almost no cache. Then I bit the bullet and bought a surplus Gigabyte MB, a surplus Pentium 4 HT with 1 MB cache, and 2GB of new DDR400 memory. The processor was rated at 2.4 GHz, but easily overclocked to 2.8 GHz. Everyting was cool until those, now 7-year old WD hard drives started making weird noises. So I got two new WD 320 GB SATA II drives. But the Gigabyte MB only supported SATA I. Even so, the drives were faster. So I was happy. Then I got involved in the Vista beta test and just had to see AERO for myself. It turns out I didn’t care for it, but not after I bought a new ATI X1300 AGP video card (the Gigabyte MB has not PCI Express slots). I guess I should be happy with this, but when I’m working on large projects in Visual Studio, even 2 GB of RAM is not enough (doesn’t matter if I’m running XP or Vista). 1. AGP video slot for my ATI card or at least decent on-board video until I can afford to replace it. 2. Support for my DDR400 memory with room for at least 2 GB more. 3. AMD dual core processor with 64-bit support. 4. At least 2 SATA II connections. I can find motherboards that meet all my requirements except for the SATA II connections! I can find a decent AMD processor for $180 (but they use socket 939 and not the newer AM2 and also use more power). Sorry about this. I just get so excited when I upgrade hardware. Well, Long thanks for the inspiration! Wow! I think your version is really cool and funny! If only it was more Vista friendly… It’s too bad the empty space is not in the right of the screen with the die a bit to the left as it would work better with the Vista sidebar on the right of the screen. 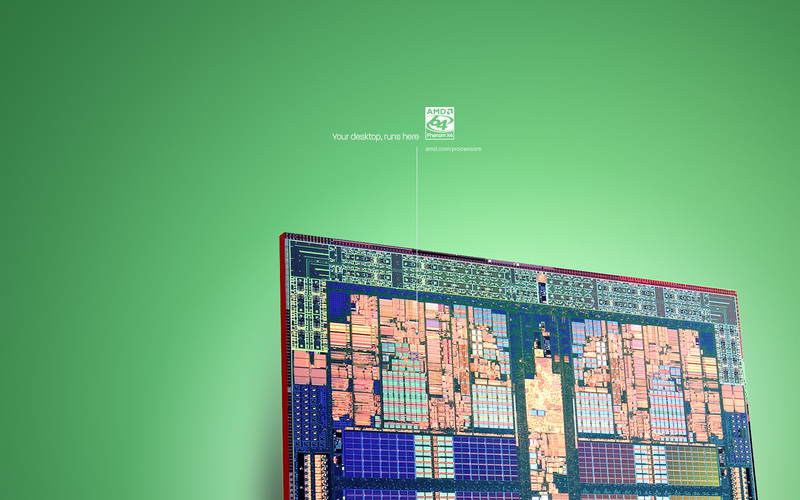 amazing wallpapers for AMD fans…. you have more wallpapers, if yes, please share with us. thanks again for this wallpapers. very simple, very elegant. I would’ve preferred if the comma wasn’t in the slogan, but that’s about it.